Original equipment and aftermarket pistons for the same engine may use different diameter wrist pins. Check the piston you plan to use before ordering. In most cases we know that C-Clippers will work for you right out of the box. However, because there are literally thousands of pistons out there, we sometimes need specific dimensions. Call us toll free 1-866-336-8665 or e-mail. Our secure, online payment processing of Visa, MasterCard, American Express and Discover is handled by PayPal. If you prefer to order over the phone with a customer service agent, call us toll-free at 1-866-336-8665. 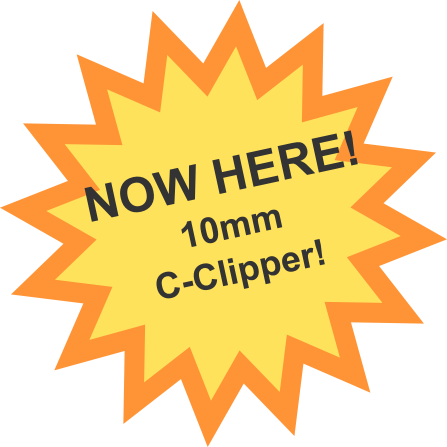 We stock replacement installers, sleeves and v-blocks for all of our plain sleeve and undercut sleeve C-Clipper kits. Ordering is easy, just find your kit below and select the kit number followed by -I for the Installer, -S for the Sleeve, and -V for the V-Block. The table lists stock items. Kits include plain sleeve, short installer, and appropriate Delrin V-block. If you order a kit, you do not need to order the sleeve, installer or V-Block separately. 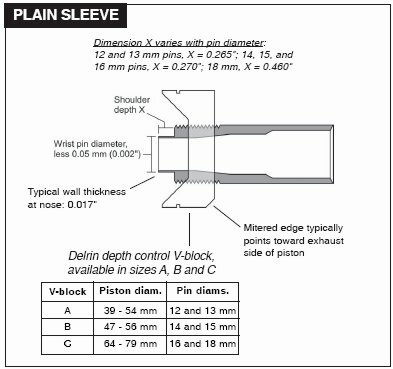 Replacement parts can also be ordered for the Plain Sleeve C-Clipper by selecting the kit number followed by -I for the Installer ($23.00), -S for the Sleeve ($15.50), and -V for the V-Block ($8.50). Click the Kit # below to order online using PayPal. 305-V 10mm A 39-54mm Chainsaws: Stihl, Husqvarna, etc. 303-V 14mm B 47-56mm Most 80 and 85cc 2-strokes: Honda, KTM, Kawasaki, Suzuki, Yamaha, etc. 301-V 15mm B 47-56mm Most 125cc 2-strokes: Honda, Kawasaki, KTM, Suzuki, Yamaha, etc. 401-V 16mm C 64-79 mm ATVs: Honda, Kawasaki, KTM, Suzuki, Yamaha. Also for Watercraft, Snowmobiles, etc. 302-V 18mm C 64-79mm Most 250cc 2-strokes: Honda, Kawasaki, KTM, Suzuki, Yamaha, etc. Also most KTM 300cc. If using a 300 Vertex piston (using .059 inch thick clips), this tool will not work due to the thicker clips. This tool is designed using .049 inch clips. The table lists stock items. Kits include plain sleeve, long installer, and appropriate aluminum V-guide. If you order a kit, you do not need to order the sleeve, installer or V-guide separately. 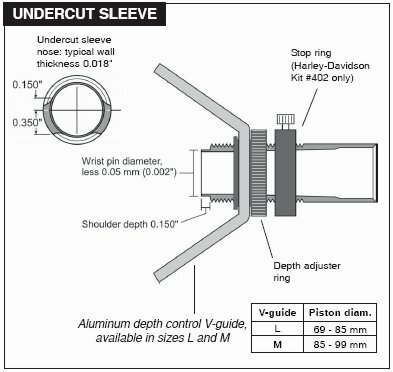 Replacement parts can also be ordered for the Undercut Sleeve C-Clipper by selecting the kit number followed by -I for the Installer ($24.00), -S for the Sleeve ($29.00), and -V for the V-guide ($15.50). The V-guide for the Harley Davidson kit #402 is $19.65. * Including most after-market standard bore and big bore engines. Not available at this time for Harley-Davidson Twin Cam, Iron Sportster, and other legacy engines.